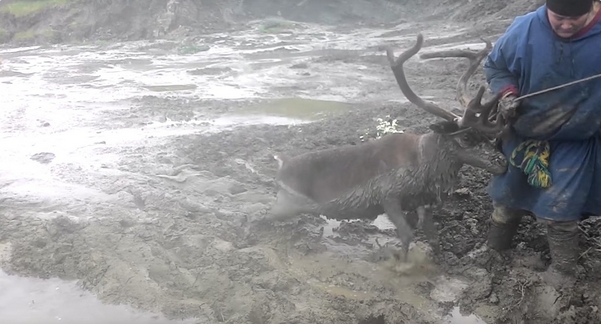 A reindeer caught in a sticky and deadly situation was saved after some men traveling by happened to spot him. 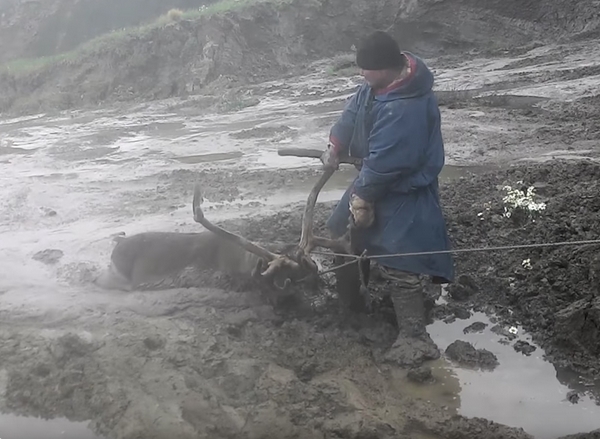 The reindeer was stuck up to his back in mud in the Yamal Region of Russia. The reindeer, also known as the caribou in North America, is a species of deer with circumpolar distribution, native to Arctic, sub-Arctic, tundra, boreal and mountainous regions of northern Europe, Siberia and North America. This includes both sedentary and migratory populations. Rangifer herd size varies greatly in different geographic regions. The Taimyr herd of migrating Siberian tundra reindeer in Russia is the largest wild reindeer herd in the world, with numbers varying between 400,000 and 1,000,000. What was once the second largest herd is the migratory boreal woodland caribou (R. t. caribou) George River herd in Canada, with former variations between 28,000 and 385,000. As of January 2018, there are fewer than 9,000 animals estimated to be left in the George River herd as reported by the Canadian Broadcasting Corporation. 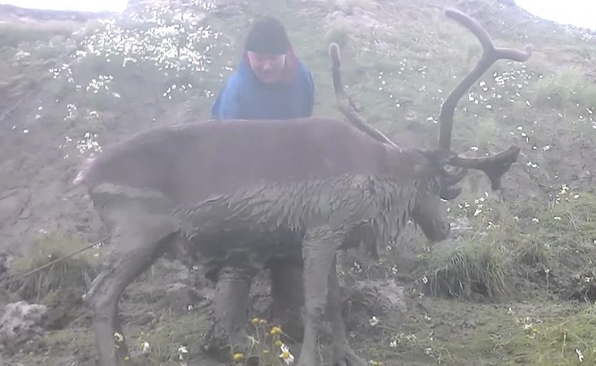 "Caribou have large feet with four toes. In addition to two small ones, called "dew claws," they have two large, crescent-shaped toes that support most of their weight and serve as shovels when digging for food under snow. These large concave hooves offer stable support on wet, soggy ground and on crusty snow. The pads of the hoof change from a thick, fleshy shape in the summer to become hard and thin in the winter months, reducing the animal’s exposure to the cold ground. Additional winter protection comes from the long hair between the "toes"; it covers the pads so the caribou walks only on the horny rim of the hooves." 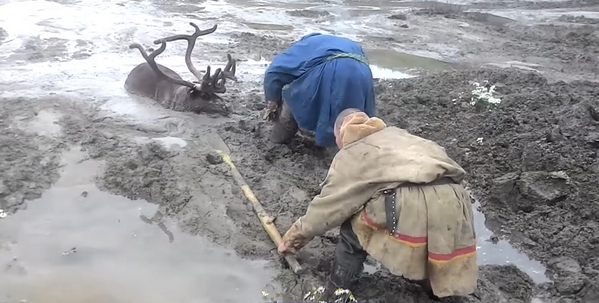 Responses to "Men Save Reindeer Trapped In Thick Mud From Almost Certain Death"